Speculative Romance Author Regina Paul: A Chocoholic Confesses by Lynn Hones 404 ~ Page Not Found! 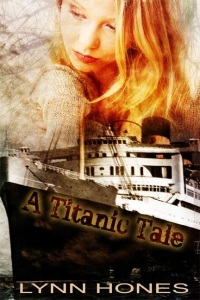 My newest release, A Titanic Tale, went on sale April 15th, exactly 100 years to the day of that tragic maritime disaster. On this blog tour I planned on talking about the Titanic, and I still will, but today something else has been on my mind. Easter was a while ago, but my kids still have their baskets hidden away. Why are they hidden away, you ask? It’s because I’m a candy fiend and they’re not. They’ll eat a piece here and there, leisurely enjoying the bounty of chocolate bunnies and those delicious jelly beans. Not me. I’ve already sniffed out their hiding places and unbeknownst to them, because I’m crafty, I’ve eaten most of it. Usually, in the middle of the night, I start my commando mission. I wake up and tell myself, “Not tonight. No, you’re stronger than this.” Two minutes later I’m tiptoeing into their rooms and silently rifling through the plastic green grass for those little pieces of paradise. I wake in the morning surrounded by the brightly colored foils of Ghiradelli Chocolate eggs and feel remorse, shame and guilt wash over me as swiftly as Willie Wonka’s wonderful waterfall washes over the rock candy in his factory of caloric hell. I’m an older woman—fifty-two-years-old, when will this insanity stop? I know admitting I’m a candyholic is the first step, but I guess if lying to, and stealing from my own innocent children is not my bottom, I’m destined to wallow in the chocolate river of aforementioned movie as a bottom-feeder, forever. When they were small, I’d hide the box of Ho-Ho’s I bought at the grocery store, lest they see them. When the craving for chocolate came on, I’d grab one, (or God help me, two or three,) from the box and slowly retreat to the bathroom and close the door. Unwrapping, as quietly as I could, I’d hear breathing on the other side and see the shadow of pint-sized feet under the crack. “Mommy, what are you doing?” I’d hear. “Nothing,” I’d mumble back with a mouth full of chocolate goodness. “No, I’m almost done.” Swallowing, I’d wipe my mouth on a towel, shove the wrappers deep in the wastebasket, flush the toilet for effect and walk out. “I smell chocolate,” one of them would say in childlike innocence. “Oh,” they’d answer in unison, a look of confusion washing over their faces, and walk away. Not too long ago my youngest was talking to me while standing next to my bed. Her hand inadvertently found its way between my mattress and box spring and she pulled out wrapper after wrapper of damning evidence. I’d been found out. My adrenaline rose, our eyes locked and she screamed for her sister like a banshee on a mission. My oldest came running in and they both glared at me as if I were Arthur Slugworth, the villain hired by Mr. Wonka to fool the children into selling the gobstopper as a morality test. And I felt like him, too. Or, should I say, I felt like one who’d failed his said test of integrity. How low will I go? When will it stop? What am I doing to my family, my children, my home? I wish it would all come to a brilliant cinematic end. Me, finally admitting I can’t take it anymore as I renounce my love of candy. In the multi-directional glass elevator, I’d take flight out of that chocolate river of guilt infested waters for the fresh blue skies of healthy living. I’d renounce my candy and sweets binging, cravings of green vegetables and ripe fruits my new normal. What an ending…what an ending. Nope…not going to happen. Callie went to her window and stared out at the streetlight in front of their house. Lost in thought, she caught a quick movement, but ignored it. When she saw a small child peek out from behind a telephone pole and looking up into her window, however, she grew concerned. “What the hell?” She watched the little figure’s head dart from behind the pole, look up at her and quickly retreat back. It seemed to either be playing games with her, or trying to hide. The child gave no reply. She walked out of her room, down the stairs and opened the front door. I bet some neighbor kid walked out of their home and can’t find how to get back. Stepping out on the porch, she wrapped her arms around herself. The air was still hot and muggy, but it was worry, not chill that had her hugging her body. No movement, but she saw an arm still visible from around the pole. Gathering some bravado, she stepped off the porch and walked toward it. The person stepped out from behind the pole. Callie’s eyes had adjusted enough to see a boy with light hair and fair skin. His clothes, if that’s what they could be called, were rags. A gray suit, that had to be several years old, hung off his skeletal frame. “Hi, honey. What are you doing out here so late?” Callie squatted and held out her arms for the boy, hoping to show him she meant no harm. His dirty, drawn face held the soul of an adult, although he couldn’t be older than three or four years. “I don’t know,” he said shyly. He pointed down the road. Once in the car, she drove for about a mile. Every so often, she glanced at the boy to see if he recognized anything. “Thank you kindly, ma’am.” He sat up, straightened his legs and looked out the window, obviously searching for something familiar. His thin hands were folded neatly in his lap, but rose occasionally to point the way. Callie realized he was leading them to the neighborhood where the Coopers lived, Bainesworth Manor. It butted up against a large field that turned into woods further back. On the other side of the street were miles of barren farmland, waiting patiently for the inevitable McMansion to be built. However, they drove past Bainesworth Manor and about a half mile down the road he spoke. “Here it is,” he said timidly. She pulled into a dark, park-like area barren of any homes. Her blood ran cold when, upon closer inspection, she noticed it was no park, but a cemetery. Not just any cemetery either, this was the kind of cemetery where skeletons wandered and witches made their brew. The kind where werewolves hid behind gravestones and hands reached up from the netherworld, searching around for the ankles of unsuspecting mortals stupid enough to be in a graveyard after dark. She pressed the gas pedal, but instead of moving, the car died. “What?” Frantically, she turned the key and the engine turned over once and stopped. After several more tries she realized if she continued she’d simply flood the engine. She reached into her purse for her cell phone. In her panic, she’d forgotten her passenger and looked across at him. “Sweetie, this is a graveyard. It’s not your home.” Unable to find her phone, she dumped the contents of her purse between the driver and the passenger seat. “Dammit. This is not happening.” Without even glancing his way, she apologized for her use of foul language. Resigned, she sat back in the seat and stared ahead. “Great, I guess we can walk to the Coopers.” She put all the items back into her purse. Slinging it over her shoulder, she grabbed a flashlight out of the glove box and stepped out of the car. This cemetery was unknown to her, but from the looks of the dates she spotted as they walked, it had filled up long ago. The new one, where Blake was buried, was on the other side of town. Attempting a bravado she didn’t possess, she closed the door and moved away from the car. The moon cast enough light to see perfectly. He pointed into the cemetery. She smiled at him. “Come on, let’s get you home to your mother.” She put her hand reassuringly on his shoulder. Large prickly gooseflesh covered her body from head to toe at that comment. Something wasn’t right. She’d suspected it the first time she’d laid eyes on the boy, but now, she knew for sure. He began to walk. In the middle of the graves in a noticeably older area, he stopped and turned toward her. He seemed to grow paler, thinner, and sadder. He took a couple more steps, stopped and stared down. “I be home now, mum.” His expression was heartrending, his large eyes rose and met hers. A wind picked up and, before her eyes, he metamorphosed into a mist, which swirled about for a moment before sinking into the ground. A cold sweat broke out on her skin and a crippling fear stabbed roughly at her chest. An ugly, wintry fright came close to bringing her to her knees and impaled her to the spot. Paralyzed, she willed herself to breathe. “How…why?” She gathered her courage and backed away, clutching her stomach, forcing the urge to vomit away. Great piece about the chocolate addiction, Lynn -- I'm still there, with Cadbury's easter eggs hidden in various drawers and cupboards throughout the house! What sweet pleasures secret treasures are!